Lent is almost here, friends, and we are excited at the Mission Cincinnati to journey through this season together. If you come from a tradition that does not follow the Christian Calendar, you may be wondering what Lent is all about. Well, in the simplest terms, Lent is the 40-day period prior to Easter that starts with Ash Wednesday. It is a time of devotion and discipline as we prepare our hearts for the great celebration of Jesus’ Resurrection on Easter Sunday. (By the way, the Sundays in Lent are not counted in this 40-day penitential period since Sundays are always feast days.) As we journey through this 40-day period together, we keep a double focus. On one hand, during Lent, we seriously consider sin and our fallen human condition. If we are truthful with ourselves, during this season of Lent, we say with the apostle Paul “I do not understand what I do. For what I want to do I do not do, but what I hate I do” (Romans 7:15). During Lent, we admit that we are sinful individuals – that we continually wrestle with pride, self-centeredness, hatred, a need to be in control, envy, prejudice, and many other vices. On the other hand, we also reflect on the Christian hope throughout the entire season of Lent. Though we are sinful, Christ so loved the world that He died for us while we were still sinners and then He was raised from the dead, opening up the possibility for those who believe to be reconciled with Himself. Not only that, but he opened up the possibility of healing, transformation into Christlikeness, and abundant life through the power of the Holy Spirit working within us. So, in Lent, we are always looking forward to the triumph of Easter Day even as we grapple with the our fallen conditions. So with this great truth in mind, we enter into this season of Lent with a firm sense of God’s love for us, as well as a desire to engage practices that will open us up to God’s healing, liberation, and transformation. And so friends, since the earliest of times, it has been typical in the season of Lent to take on some new rhythm of prayer, self-examination, confession, fasting, and giving/generosity. We give up certain habits and take on other habits so that we might we might become more like Christ and so that we might grow closer in our relationship with Him. Some of you may be wondering, however, “how do we do this?” So, with this question in mind, I have compiled a list of suggested practices that you might take on during this season. You can find it below. Before you check out this list, however, let me provide the following caution. Please do not feel as if you should do all of these. Especially if you are new to Lent, take on one or two new practices and put your energy into those. Remember that the point of these practices is not to check off as may boxes as possible but to be self-reflective, to draw closer to Christ, and to open yourself up to the work of the Holy Spirit in your life. So consider which practices will help you do this the best in this season. And if you are unfamiliar with these practices, consider coming to Oasis on Wednesday nights, where we will engage in some of them throughout the season. Also seek me out for guidance. · An American Lent– Given our church’s context, I believe this would be a great devotional for us as a church to engage this season. Written by priests in our denomination, as well as others, this devotional will lead us through a process of understanding the 400 years of slavery, oppression, and racism that have existed in our country and will invite us into a process of reflection and prayer. · Center for Christianity, Culture and Arts (Biola) Lenten Project -- This beautiful online devotional, which is newly re-imagined each year, takes you through Lent with beautiful art, music, and reflection on Scripture. Prayer– Consider taking on practices of daily prayer, examen, or lectio divina during this season. You can find explanations of these practices at The Vine and the Way, my spiritual formation blog, as well as find links out to prayer resources. Reading Scripture– Take on a Scripture reading plan or join a Bible study for this Season. If you are a woman, consider joining Katie Mosley’s Women’s Bible Study this Lent. As another option, Anne Rothaas also suggests this Bible study on Job that you can do on your own. If you would like to wrestle more with some of the content of Anne’s sermon from a couple of weeks ago, this could be a good study for you. Officiant: Dearly beloved, the Scriptures teach us the importance of acknowledging our many sins and offenses, not concealing them from our heavenly Father, but confessing them with humble and obedient hearts that we may obtain forgiveness by his infinite goodness and mercy. We ought at all times humbly to acknowledge our sins before Almighty God, but especially when we come together in his presence to give thanks for the great benefits we have received at his hands, to declare his most worthy praise, to hear his holy Word, and to ask, for ourselves and others, those things necessary for our life and our salvation. Therefore, come with me to the throne of heavenly grace. Silence is kept. The Officiant and People say the following. Officiant: Amen and hear then the good news! That all who are in Christ Jesus are a new creation. The old is gone and the new has come. By the power of Christ’s shed blood on the cross, I proclaim that you are forgiven ones, and your sins have been removed from you as far as the east is from the west! Let us rejoice therefore and let us worship our King! Officiant O Lord, open our lips. People And our mouth shall proclaim your praise. response prayer. I will voice our collective prayers and petitions to the Lord, and after each section, I will say “Lord in Your mercy,” and you are invited to respond “Hear our prayer!” Let us go together before the Lord in prayer. Almighty God, you have given us grace at this time with one accord to make our common supplications to you; and you have promised through your well beloved Son that when two or three are gathered together in his name you will be in the midst of them: Fulfill now, O Lord, our desires and petitions as may be best for us; granting us in this world knowledge of your truth, and in the age to come life everlasting. Officiant:. The peace of God which passes all understanding keep your hearts and minds in the knowledge and love of God, and of his Son Jesus Christ our Lord; and the blessing of God Almighty, the Father, the Son, and the Holy Spirit, be among you, and remain with you always. Amen. Thank you for joining us for worship today. Advent is here, and I am excited! Now, I don’t know about you, but Advent is my favorite season of the Christian Calendar, and it’s not just the lights, music, celebrations, and retelling of wondrous Biblical stories that bring me delight in this season. I do absolutely love those aspects of the season, but my real sense of joy comes from time spent meditating on God’s loving faithfulness and time spent being honest with God in this season. Perhaps more than any other season, Advent allows me to give expression to my full range of emotions – from joy to wonder to hope to sadness to yearning to anger to fear. I love that about Advent. I need that. You see, in Advent, we not only wait to celebrate Jesus’ birth on December 25th, but we also wait in great anticipation for the Second Coming of Jesus when He will return in glory and will finally restore and renew all things. This waiting also opens up a space for self-reflection as we wrestle with how we ourselves contribute to the brokenness in our relationships and in the world, and as we wait for God to renew our own hearts. The truth is that the world is broken. We are broken. And Advent gives us space to grapple with this reality. Despite the saccharine nature of many of our culture’s Christmas practices, Advent is not a time for sugarcoating the reality of our world or the reality of our feelings or the states of our hearts. It is a season for honesty, and it is in this honesty that we can find the true joy that Jesus wants to give us in this season. A joy that is not built on reindeer, snowmen, Christmas trees, pretense, or pageantry, but a joy that is grounded in an authentic relationship with God where we can wrestle truthfully with the state of the world and with the state of our hearts. A joy that is built upon God’s loving faithfulness and His promises to make all things new - realities that remain true no matter what the states of our hearts and feelings are. In this season, we are reminded that God so loved the world that He created it in the first place, and then when people walked away in sin, He called out a special nation, Israel, to be a blessing to all nations. In this season, we are reminded that when Israel failed to fully live up to its call, God so loved the world that He raised up a shoot out of the stump of Jesse; this shoot was Jesus. This Jesus, the Messiah, the Second Person of the Trinity, was God in flesh who came to this world out of love, ultimately died and was raised from the dead for love of the world, and then sent love and joy into our hearts when he gave the Holy Spirit to those who believed. In this season, we are reminded that it is this same Jesus who will one day return and renew all things because He so loves the world. It is because of this steadfast love and faithfulness that God has shown his people over thousands of years that we are able to hold out true hope during this season, and it is through this hope, coupled with our ability to be honest before the Lord with all our emotions and responses to the world around us, that we can develop a true and deep and abiding joy in this season. This is why I love Advent, and this is why I hope you do too. Welcome to Advent. May you experience true joy! While it is definitely not the pageantry of this season that brings true joy, nevertheless there are some practices that we as individuals and the church as a whole can embrace, which can help to foster this joy during this season. Here are some brief explanations of some very common Advent practices. Almighty God, give us grace to cast away the works of darkness, and put on the armor of light, now in the time of this mortal life in which your Son Jesus Christ came to visit us in great humility. So as we come into our worship space each week and go about our lives during the rest of the week, we are called to find spaces of self-reflection. Let the color purple remind us of this, for only as we are real with ourselves and real with the Lord can we find that deep and abiding joy that God would like to give to us. Each Advent, churches usually set aside some time for quiet days, retreats, reflection, and prayer. This year, our church is setting apart time on Wednesdays and alternating Sundays. In the busyness of the season, it can be difficult for us to focus on the true meaning of Advent. With this in mind, we purposely set aside time for silence, prayer, reflection of Advent Scriptures and music, and conversation with God and each other. We do this so that we might hear from God and live more fully into this season. We also encourage each one of us to create space in our own days and weeks to find this time to be alone with God – to just “be” with the Lord - to express our laments and frustrations, to give voice to our longings and hopes, to get in touch with our hearts, to make space for self-reflection, and to reflect upon and rejoice in God’s faithfulness. 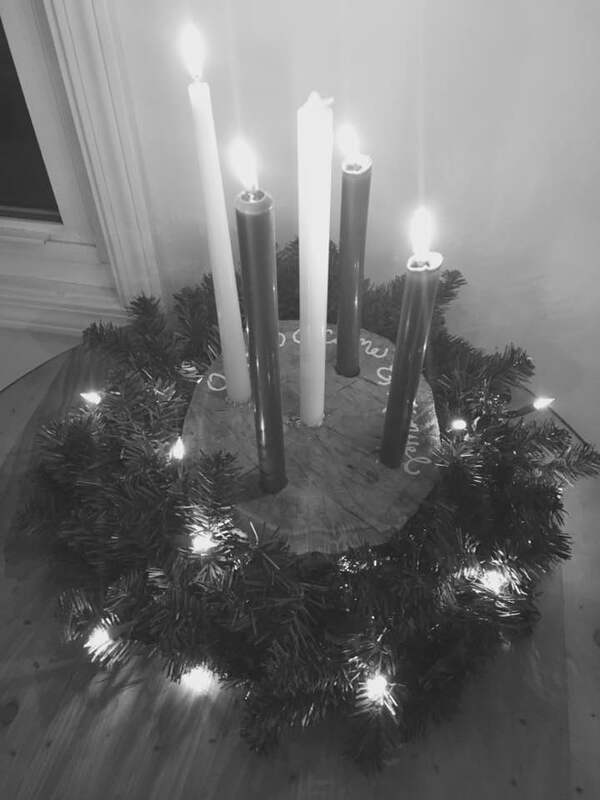 The traditional Advent wreath is in a circle, which symbolizes God’s eternity. Each Sunday in Advent, we light a new candle. This progressive lighting represents the great Light has dawned in the land of darkness (Isaiah 9). It symbolizes our hope and our waiting for the coming of Christ – both for the celebration of His birth and His Second Coming. Three of the candles are in the traditional penitential purple, but the fourth candle, which we light on the third week, is pink and represents joy. All of the candles symbolize one of the virtues that God awakens in us: hope, love, joy, and peace. As for the middle candle which is white, it is the Christ candle, which is lit on Christmas Eve and symbolizes that the Light of the World has come. In recent years, some people have also taken up lighting an Advent spiral. Instead of lighting a candle each Sunday, one lights a candle each day in December. The progressive lighting marks time just as an Advent Calendar does and again reminds us of Jesus, the Light that is dawning in the darkness of our world. The lighting of the candle often corresponds with our time for daily prayer and devotions, either as a family or as an individual. Much like the candles we light on Advent wreaths, the lights we put up on our trees and our houses also represent the Light of Jesus coming into this world of darkness. So as we light the candles in our Advent wreaths at church and at home this year or as we appreciate the Christmas lights all around us, let us remember Jesus the true Light of the World who is the source of our salvation and joy. The Anglican Lessons and Carols Service is a traditional service that churches hold sometime in December. While our church won’t be hosting one this year, I know that some of us will be attending these services elsewhere. What is the purpose of this service? Well, as the name suggests, it is simply a service of reading Scriptures and singing Advent (and maybe a few Christmas) carols. The Scriptures and music take us through Creation, Fall, the Call of Israel, the Waiting for a Messiah, and the pregnancy of Mary (and all the other wondrous events that go with that). Through that service, we are reminded of God’s faithfulness over the millennia as we prepare to celebrate the birth of Jesus and as we wait for Jesus to come again to bring peace and justice into this world. The Jesse tree serves a similar purpose as the Lessons and Carols but it is generally a practice that is done at home with the family. Each day, usually starting on December 1st, children and adults with child-like imaginations read an Old Testament story and hang an ornament on a Jesse tree, which symbolizes the shoot that arose out of the stump of Jesse (Isaiah 11:1), which of course was Jesus. Like the Lessons and Carols, the Scriptures take us through Creation, Fall, the Call of Israel, the Waiting for the Messiah, and the pregnancy of Mary, but it covers more of the Old Testament since there are 25 days to reflect on these stories of God’s faithfulness throughout time. As we reflect on this faithfulness, the true joy of the season arises in our hearts as we remember God’s love and promises. CK’s monologue is hilarious because we all know how true it is. We’ve all experienced frustration or even rage at things that make life SO MUCH MORE CONVENIENT for us today than it was for people 100+ years ago. Ever been annoyed when your wifi goes out at a coffee shop or in your home? Yeah, you know what I’m talking about! We’ve grown accustomed to everything working for us instantly. So much so, that when it doesn’t, we feel that the universe has offended against us. Perhaps this is why so many of us find the idea of relating to God so frustrating, anger-inducing, uncomfortable, or weird. God, if we even think He exists, is rarely experienced by any of us as convenient or instantly and always giving us what we want. When this looks like God failing to help us win the lottery, that’s an offense of His that most of us are willing to get over. But when it comes to our angry, lonely, suicidal, rubber-bullet-on-refugee firing, school-shooting-up, opioid-addicted, hate-crime-committing world, the fact that God doesn’t seem to be doing anything to actively fix these matters when He’s supposed to be both good AND all-powerful, is usually enough to make us either not believe in Him or hate His guts. And these reactions are only felt by the most honest and reflective of us. More often today, we don’t spend enough time sitting with our painful emotions to even KNOW what we’re feeling, why we’re feeling it, and who we’re blaming. Instead, we resort to entertainment, addictions, or distractions: anything we can turn to that’s loud enough to pull our attention away from the deepest darkest things that are robbing our joy, fueling our anxiety, and causing us to doubt—if we’re honest—that life is really worth living. This is why we NEED Advent. Advent is the first season in the Christian church calendar. It is the approximately 4-week-long season leading up to Christmas, during which Christians throughout history have made space in their lives to attend to their own hearts, and to acknowledge where they are frustrated, discouraged, and painfully WAITING for God to show up and do something in their lives. It is also the space where Christians throughout history have re-anchored their lives in the great story of the God revealed in Jesus Christ: the God who once came into our world as a fragile Middle-Eastern baby, who was crucified, and who, Christians believe rose from the dead, ascended into heaven, and will one day RETURN to end pain and suffering, destroy death, establish complete justice, and wipe every tear from every eye. For these reasons, Advent is also a season of hope. To us, a people who live in a land of deep darkness, light has shined, it is shining, and in Jesus, one day, it will WIN. Advent reminds us that the hope extended to our world is that in Jesus, we are waiting on something better than just good immigration laws or gun violence mitigation strategies (though working toward these things is good and important). We are waiting on the total healing and transformation of our world. In this story and with this God, we have space to honestly name and forcefully express all of our sorrow and anguish. And then we are invited to spend time with a God who hears us and promises that He will one day make all of these things well. Jesus came into our world once as a man so He could fully understand what we feel when we suffer, and He will come back into the world with power strong enough to end all suffering and dispel all darkness. Black Friday and the Holiday Season commercial machine teaches us to ignore and RUN from our pain, to feast on the cotton candy of nostalgia. But the best that all of this can offer is false hope that will, in the end, leave us empty. Jesus, the real Christmas story, and the journey of Advent invite us not to RUN, but to WAIT: to sit with God’s people throughout history as we have all waited on the healing of our hearts and the fixing of our world. To recognize the depth of our need, and to feast on the presence of the only ONE who can meet us in our darkness and do something about it. This year, don’t run from your pain. Don’t bury your hope. WAIT. Wait with the people of God for healing and transformation. Make space to hear the story of God, the promises of Jesus, the hope of the Gospel. Feast on the One who is real, who can satisfy you, who can give you light to dispel the darkness. New to Advent? Looking for a community to enter into this special season with? We’d love to invite you to join us at The Mission Cincinnati for any of our worship services, every Sunday from now through December 23rd at 10 AM at the Evanston Recreation Center (3204 Woodburn Ave. Cincinnati OH 45207). Every service will include beautiful music, passionate singing, space for prayer and reflection, inspirational teaching from the Bible, and a celebration of communion. We have a nursery for infants and toddlers and a Mission Kids ministry for children ages 4-10 featuring The Gospel Project curriculum. We will also have two contemplative Mission Communities hosted by Rev. Kristen Yates in her home on Sunday afternoons at 4 PM (12/2 & 12/16) and every Wednesday evening at 6:30 PM. You can contact Kristen at kristen@missioncincinnati.org for address info if you’d like to attend. These spaces will offer yummy snacks, silence, contemplative prayer, and a chance to meet other folks on a spiritual journey. We can’t wait to meet you this season! Praying that you would experience the fullness of Christ’s presence, power, and love in these days! Grace, peace, and blessings from our team here at The Mission Cincinnati as we wait on the world to change together! I was sitting at a table a month ago across from a pastor who had grown up in India and who had recently moved to America. “You have NO RELATIONSHIPS in this country,” he said. He unpacked this statement with many examples, two of which had to do with families. In his collectivist culture, elders move in with their children in old age, and children rejoice in the provision of their parents for education, weddings, etc. In OUR individualist culture, he observed, parents are shamed for depending on their children in old age, and move into retirement homes by themselves. Children are shamed for relying on their parents to pay for college, and work multiple jobs or take out loans to avoid having to ask. As a result, we do not know each other because we have pursued every possible option other than the interdependence that would fuel increased connection. As we approach Thanksgiving and Giving Tuesday, and in light of this pastor’s cultural observations, it is interesting to reflect on Jesus’s words recorded in Acts 20:35 that “it is more blessed to give than to receive.” It seems to me that all genuine and healthy relationships are marked by GENEROSITY. Friends speak and act kindly to one another, not out of obligation, but out of a simple desire to. Spouses, at their best, love, serve, and sacrifice for each other not because they have to, but because they want to. This goodness of relationship is characterized by a heart that overflows with generous love toward another. Our open-handed, joyful, other-loving generosity builds trust, encourages reciprocity, expresses grace, and all of this BUILDS RELATIONSHIPS. Our divided world so desperately needs more healthy and functional relationships. Our cities and neighborhoods are suffering not just from material poverty, but from relational poverty as well. We don’t know each other, and therefore, we don’t help each other, and those with needs are disconnected from those with the resources to help. Likewise those with the resources to help don’t know those in need or where to give or how to serve, and as a result we are left in lonely silos, just like my pastor friend observed. We need each other. And perhaps generosity is the key to building these relationships that could repair our world and heal our loneliness. At The Mission Cincinnati, alleviating relational poverty is one of our central goals. We are blessed to be in relationship with many other ministry partners across our city and country. As we prepare for Giving Tuesday, we wanted to take a few days to highlight some of these ministry partners, so that you can get to know them too, so that you can give to support their needs, and so that as a result, you can build new relationships strengthened by generosity. So over the coming weeks, make sure to stay tuned to our Facebook page as we share stories and needs from some of our partner organizations. Maybe one or two will touch your heart and God will lead you to give to support their work. And maybe as a result you will build a relationship, make a friend, step into service and experience the truth of Christ’s words that it really is more blessed to give than to receive! In case you’re curious as to what specifically I mean, I classify as fascinating those things that irresistibly draw my attention and interest. I’ve had a lot of fascinations in my life. As a kid I was fascinated by space. I loved the Star Trek movies, reading coffee-table-sized books about the planets and the universe and the science of stars, building spaceships out of LEGOs and LOVING watching that alien space ship blow up the Empire State Building in Independence Day. Later on in elementary school, I was fascinated by skyscrapers, then by America’s roller coasters, then by outdoor expeditions, especially the most terrifying climbs on the world’s tallest mountains. Being fascinated is a great emotional experience. It’s exciting, even energizing. To live a fascinated life is to spend your time on the edge of your seat. To feel connected. To share something. Fascination also seems to be the opposite of fear. When we are afraid of something or someone, we pull away, but when we’re fascinated, we draw close. I’m worried that our world seems filled up with increasing amounts of fear. We’re afraid of the economy and how it will affect our retirement or our job security. We’re afraid of technology and how it’s changing our brains. We’re afraid of our President’s Twitter feed and how it might affect North Korea’s bombs. We’re afraid of the increasing number of school shootings and what that means about our society. We’re afraid of our kids growing up and moving out into a scary and unfamiliar world. We’re afraid of our parents dying, and having to ourselves become people others look to for “wisdom” in a world we no longer understand. We’re afraid of people whose skin color is different from ours, afraid of people who practice a different religion, or who identify with a different political party. There’s so much to be afraid of that fear can take up all our time, steal all our attention, and rob all of our peace. What if fascination is the antidote? What if fascination is a pastime that can be practiced? A skill that can be improved upon? A spiritual discipline that can help us recover joyful space in our brains and our hearts? A tool to build friendships with people or bridges across difference so that we can get to know and love the very people who could heal our deepest pain and who, through knowing them, might dispel more and more of our fear? What fascinates you? Wouldn’t it be fun to talk about those things and share them with others? Come join the conversation! We want to know what fascinates you and maybe as we get to know you, share a little bit about what fascinates us! Feel free to comment here or on our Facebook page: https://www.facebook.com/themissioncincinnati/! More opportunities to get involved will be announced and shared soon! I say that to people a lot too. But as I take a moment to reflect on it, I’m not sure “tired” really does justice to what I’m feeling. Most days, its not just that I could use more sleep, though that would be nice. What I could really use is a recharge of my soul. A button I can press to restore my emotions to equilibrium. Space that is quiet and undistracted in which I can think and be with God. Recently my Facebook newsfeed has been inundated with memes showing people’s despair and inability to complete tasks that life and the world seemingly require of them. The caption is always the phrase, “I can’t even.” Also popular is the #adulting terminology. Captured in these sentiments is the idea that our younger generations are waking up to the reality of a world that demands more of us than we expected, more than we have to give, and the constant attempt to psych ourselves up enough to participate in the rhythms of that world is exhausting. And so we all find ourselves not just needing more sleep, but needing our souls recharged and our emotions set at peace. We are all longing for space and quiet where we can focus, think, and be with something or someone beyond ourselves who can remind us who we really are. We are a weary people. And the good news for us is that the God of the Universe revealed in the pages of the Christian Scriptures and the person of Jesus Christ is a God who said once 2,000 years ago and still says today, “Come to me all who are tired and heavy burdened and I will give you rest.” Jesus is the God of the soul recharge. He is the One who can restore our emotions to equilibrium. He is a God who invites us to sit with Him in quiet, undistracted spaces where we can think, pray, and be with Him as He reminds us who we are. This week marks the beginning of the season of Lent. Christians across the world today and throughout history have observed Lent as an annual season of repentance. Beginning on Ash Wednesday and ending on Easter Sunday, it is a time to prepare our hearts for the primary events of the Christian faith—the death and resurrection of Jesus Christ. In the early Church, Lent was a time for new converts to prepare for baptism by learning the theology and practices of their new community. This included a special emphasis on fasting, prayer, repentance, and giving to the poor. For Christians today, Lent is a time to be renewed in the reality of our baptism. It is a time to deny self, take up our cross, and follow Christ in every area of life. For those of us who grew up in churches that talked about Lent, my guess is that we associate this season with what we DON’T do, what we GIVE UP. While the practice of Lenten fasting is right and good, it is only part of the story. Lent has often been referred to as a period of “bright sadness,” because, as many Christians throughout Church history have experienced, the God-ward practice of small deaths through abstaining and giving up is inextricably bound up with the intentional taking on of new life. Lent is about more than simply what we don’t do, its about the practices that we LIVE INTO with intention, believing that the extraordinary God who often makes dead people come back to life might burst into our ordinary moments of fasting, solitude, silence, and prayer with resurrection life and power. Rightly practiced, the season of Lent is not an obligation, but a gift for Christians. It is a season where Jesus invites us to reorder our habits, refocus our attention, redirect our lives. It is a season given to us as a soul recharge, an occasion to practice peace in our emotions, an opportunity to enter God’s rest. We all need Jesus. Lent reminds us of this urgent and often painful reality. But it also brings us right up to the edge of the Gospel as we remember that Jesus has come to us and made the life of God available to us. Lent is therefore an opportunity to make space and be with God. It is for all of these reasons, that our church, The Mission Cincinnati, will journey through Lent by practicing the disciplines of the faith that many of our Christian brothers and sisters throughout the centuries have practiced as means of paying better attention to God’s movement in the world, making space for His presence in our lives, surrendering our wills more completely to His, and entering into His rest. Over the next 6 weeks, we will preach through and practice the disciplines of Silence, Prayer, Sabbath, Fasting, Solitude, and Pilgrimage. We see these disciplines as resources God has given us to enter into His restful life of communion. Our hope is that our intentional focus on these disciplines in this season will help us all make space to receive more of Christ’s presence, power, and love in our lives, and that as we walk through the desert together with Jesus over the next 40 days, we will find our hearts, souls, minds, and bodies more and more refreshed. Have you ever stopped to consider that the New Testament in our Bibles is really just a collection of LETTERS? The Gospels are a collection of four versions of people telling their friends essentially, “So you want to know about Jesus? Here’s what happened:” The rest of the New Testament repeats a pattern: a church leader, a pastor, an evangelist, or an apostle, someone who has started a church in a place, writes a letter sharing something he wants to say to the people he loves that will give them spiritual vision and wisdom from God to help map the road ahead. Imagine receiving one of these letters as a house church, a group of faithful followers of Jesus locked into someone’s basement for fear of discovery, opening the letter from the Apostle Paul or Peter and waiting with baited breath for the words of encouragement, challenge, and comfort they would share. That’s the experience I wanted to recover today. What follows is a pastoral letter, essentially my words of encouragement, challenge, and comfort to us as a growing church family called The Mission Cincinnati. It is my hope and prayer that these words are not just my words, but that they will help give shape to what I believe is God’s vision for us as a fellowship of missionaries seeking to know and live for Jesus together in 2018. 2017 was a year in which we built a solid foundation. We launched weekly services, we learned how to lead liturgy together, we gained skill in the various tasks required to “pull off a Sunday morning together.” All manner of things went wrong. People moved on, new people came. We faced hardships and we celebrated joys. Some core values emerged for us: we are a church that PRIORITIZES LOCAL MISSION, in other words, we care about our place, our neighborhood of Evanston and our wider “parish” of Uptown, the collection of neighborhoods stretching from UC Clifton – Xavier Norwood. While we are generally for this city, we are intentionally and first for these communities: we invest our time here in service, we invest our relational energy here through outreach, and for some of us, we actually move into these neighborhoods. We are also a church that values ANCIENT-FUTURE worship. We are Anglican, that is, we are rooted in the tradition of the church across the globe and throughout history that has sought to follow Jesus. There are many treasures of the faith Christians have discovered throughout the last 2,000 years that have helped them connect to Christ through worship and prayer. We seek to bring these ancient treasures of the faith to life today in our services in a way that makes sense for the present, and in a way that boldly moves us forward into God’s imagined future. Finally, we are a church that values REAL FRIENDSHIP. We don’t just want to be “a community,” we want to be friends with one another, to have people over for dinner, to pray together, to share joys and struggles. We believe that befriending people across difference can truly heal our world, and we think the church is a great place to make those friendships. 2017 was a year that we began to explore these values, a year in which we got to know each other and got to know our community. If a church plant is a campfire, God built an ember base in our midst in 2017: and in 2018 He is calling us to add fuel to this fire, so that the light of Christ may burn brightly in our hearts and our life together for all to see. In 2018, I want to call us to CHAMPION PRAYER. Every time God has gotten ready to do something BIG in the world, He has prepared the way by calling His people to pray. Prayer is the fuel for God’s mission. Our lives will not have the power we need to complete our calling as a people, unless we are daily being filled by the Holy Spirit in our times of prayer alone and with each other. We need to pray for those in our spheres of influence who we long to come to know Jesus. We need to pray for the broken situations in our world we long to help mend. We need to pray for our church to become what God desires it to be! In our gatherings together on Sundays, in our midweek smaller group settings, and in our own lives individually, I hope that 2018 is a year in which we grow in our love for and our practice of prayer. In 2018, I want to call us to REACH OUT WITH JOY! You all are the most loving, hospitable, joy-filled church, and I want everyone to know about you! I want to invite everyone into our fellowship together, not because I believe our church is a GIFT I want others to receive! I want to focus this year on how we can reach out well to our fellow Evanston residents, students at Xavier & UC, and families in surrounding neighborhoods like E Walnut Hills, Hyde Park, and Norwood who may identify with our church’s vision and mission. We all need to own this work of inviting people into this community. None of us can do it on our own. And it doesn’t have to be hard or weird. It’s simply being excited about what God is doing here and sharing it with people you love: simply, joyfully, and without expectation! We’ll also have people coming to help us! I’m delighted to announce to you today officially that Rev. Kristen Yates whom many of you had the chance to meet in December has accepted a call to join our team as our Associate Pastor for Spiritual Formation & Congregational Care. Kristen is currently raising her salary to move here and we hope she may be able to join us by May or July. Kristen will bring a wealth of experience, and pastoral depth to our team. She’ll help us grow deeper with Christ and each other as a church even as we continue to reach out. Please pray for Kristen as she engages the support raising process. Additionally, we have begun conversations with CCO about the possibility of bringing a staff person to The Mission Cincinnati who would partner with the CCO chapter at Xavier to expand our capacity to reach out to college students just down the street. Our hope is that we could find a called leader of color who could help our church as well as CCO at Xavier take steps forward in our desire to be multi-ethnic ministries. Please pray for our mutual discernment with CCO and that God would provide the right leader for this position. Finally, in 2018, I want to call us to GIVE SACRIFICIALLY as a church. Financial stewardship has been a strength for our church thus far. In just one year, we have grown to sustain almost 50% of our budget through local giving. We doubled our local giving in 2017, and I’d prayerfully love to see us double it again in 2018! And here’s why: not only is giving one of the most joyful ways we can tangibly proclaim our trust in Jesus as our God and our provider over and against any other god, but when the church has financial resource, we can do effective ministry! We can invest more into our Mission Kids ministry and explore the future of what youth outreach ministry might look like…possibly in further partnership with Urban Young Life. We can invest in transforming a building in our neighborhood into a third space that can offer a meeting grounds to our neighborhood. We can continue to partner with other parachurch ministries in our city like those we currently support Urban YL, InterVarsity, and CCO. And we can continue to invest in and raise up young leaders in our midst. As we stand on the edge of a new year and look back on the one we completed there is so much to celebrate about what God has done! And there is so much to look forward to in the year ahead. Mission Cincinnati, I can’t wait to go there with you! Let’s fix our eyes on Jesus this year and together grow more and more into the church Jesus longs for us to be. Charles Dudley is a risk-taker for Christ. Just a few months after learning about The Mission Cincinnati from some friends, and after only a single visit, Charles said YES to what he discerned was God’s call to leave his home, family, and community in Roanoke, VA for the first time, and move to Cincinnati to be a part of what God was doing at this fledgling inner-city church plant. After a year of raising financial support to cover the majority of his salary (the church compensates him about a third of his monthly paycheck), Charles moved to Cincinnati to join our staff as a Missional Resident, a formational role requiring a 3-year commitment in which Charles receives professional and spiritual mentorship and coaching in an inner-city church plant context even as he serves and leads in ministry. During his time, here Charles is serving as our church’s Director of Community Outreach where he has taken the lead on building new relationships with community members and putting together creative, fun, and life-giving events to reach out to our wider neighborhood with the love of Christ. Each week Charles tutors third graders at Evanston Academy, a local elementary school, he is involved in serving with InterVarsity at the University of Cincinnati and Coalition for Christian Outreach at Xavier University. He has led a neighborhood prayer walk, taken two groups of students and community members to Christian hip-hop concerts, played a major role in leading our first ever Vacation Bible School, and joined the conversation at Mosaix Cincy, a gathering of pastors and leaders in multi-ethnic ministry contexts. Charles also serves as part of our church’s Preaching Team where he is learning the process of Inductive Bible Study and moving from text to congregational message. Investing in the formation of leaders like Charles is one of the ministries your gifts to The Mission Cincinnati will support on #givingTuesday. We’re excited to continue to grow as a church that identifies, resources, raises up and sends young leaders into Kingdom ministry in our neighborhood, our city, and our world. Know anyone like Charles who would be excited about a formational ministry experience in an inner-city church plant? We’d love to hear from you! Feel free to reach out to us at william@missioncincinnati.org and we can get the conversation going! Ms. Adkins grew up in Bessemer City, Alabama before moving to Cincinnati. She has lived in Evanston for 54 years and seen quite a bit. When you talk with her, you will certainly hear stories. But they are never stories about herself: they are always stories about the beautiful neighborhood she is a part of, and her efforts to tirelessly serve Evanston residents and see a community continuously re-imagined for the better. We are honored to be part of the Good Stories God is writing through our neighborhood and torch-bearers like Ms. Adkins. Evanston is certainly still a neighborhood of need. We have high child poverty statistics, drug trafficking is a continuous problem, and crime stats—though decreasing—are not negligible. We are also a community that is wrestling with issues of housing justice and gentrification. But this neighborhood is also full of beauty, full of life, and full of passionate residents eager to make a positive difference. As a church that loves our neighborhood and seeks to pray for and work toward its welfare, we continually seek to be a faithful presence in our place that reveals God’s Kingdom more and more on our streets and works to promote equity and justice in the redevelopment of our community alongside all the folks here who have already been engaged in this work long before we arrived. This is difficult work, but it is joyful and we are so excited about how God continues to root us more and more in this beautiful neighborhood and increase our favor with and opportunities to serve and be served by our neighbors! We dream about a future when our church can renovate a permanent space in the community and open the doors to a “front porch for Evanston” where people from every pocket of the community can come together to enjoy food, conversation, and great public events. Our work to reach out to and serve the neighborhood of Evanston is one of the many ministries you will be supporting by giving to The Mission Cincinnati on #givingTuesday! 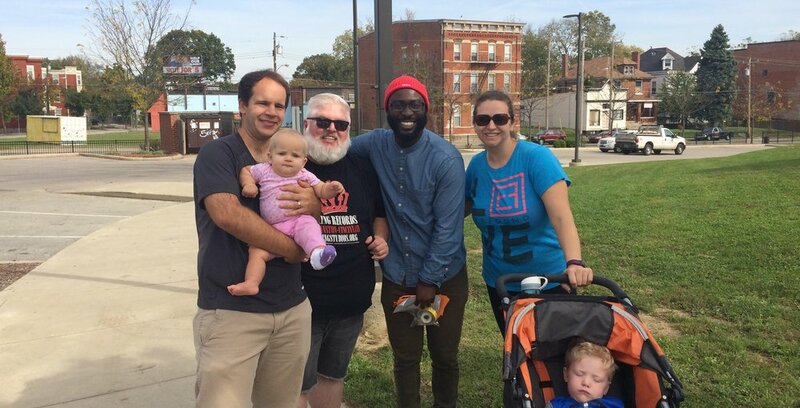 Also if you live in Cincinnati and desire to be a part of a Christian faith community that takes its place seriously and genuinely seeks to serve its neighborhood, we’d love for you to connect with you! We meet for worship every Sunday at 10 AM at the Evanston Recreation Center (3204 Woodburn Ave. Cincinnati OH 45207). We’d love to meet you, hear your story, and share ours! Have you ever watched the videos of especially festive Black Friday celebrations? The ones where the doors of a big box retail store open early in the morning to crushing waves of thousands of people stampeding and clamoring over one another to get the best deals on stuff. I find this phenomenon illustrative of the reality of our world and the state of the human heart: our world is broken and we long to see it repaired, our hearts are empty and desperate and we are longing for someone or something bigger than us to come and save us. The commercial enterprise of the “Holiday Season” (which now seems to start as early as late September) is so successful because it speaks into the longings and hopes we feel as 21st century humans. “Just buy this thing,” the holiday season enterprise promises, “and you will be happy!” Consumerism always has a shiny looking, readily-available, concrete object that promises to satisfy our longings and bring our hopes to fruition. The problem with this—that I’ve experienced and I’m sure you have as well—is that these consumeristic saviors never work. They can’t deliver. They can’t heal our hearts or make us new. If you find yourself in that place of unsatisfied longing and unrealized hope right now, I have good news for you: you aren’t alone! Such feelings aren’t new. Dating back through the history of the Church and even back to Old Testament Judaism, the people of God have always been a people familiar with longing, a people clinging to not-yet-realized hopes. The nation of Israel in exile, longed for the coming of God’s promised Messiah, the one who would rescue her from foreign captivity, heal her wounds, forgive her iniquities, and re-establish her in the land of promise. The Christian Church recognized that in Jesus, Israel’s Messiah had come, and that through the cross and resurrection, Jesus had enacted a spiritual rescue, not only for Israel, but for all people who would put their faith in Him. This same Jesus gave us glimpses through the way He lived His life, of what a world ordered under God’s benevolent Kingship would look like: no more tears, no more disease, no more sin, no more pain, no more division, and no more death. Jesus, 40 days after His resurrection, ascended into heaven and promised to one day come again and establish, in full, the Kingdom He had begun to reveal in part. Ever since, Christians throughout the centuries have longed for the second coming of Christ. It is Christ’s return that will bring the realization of the Christian hope for a world made new where people will live in intimate friendship with God again. It is for these reasons that the season of Advent emerged in the church calendar. Advent is a penitential season, indicated in worship by the color purple and observed over the course of 4 Sundays leading up to Christmas, in which the Church actively calls to mind the first coming of the Christ child in the Bethlehem manger, and looks forward to the day when the victorious Risen Christ will come again to make all things new. Advent is a journey toward Christmas that is marked by the lighting of candles along an Advent wreath. These candles—symbols of Christ’s light—are lit against a backdrop of comparative darkness that represents the brokenness and need of our world. As each candle is lit, the light grows brighter and the darkness is pushed back. As Christ comes into our hearts, our own darkness is lessened, our own wounds our healed, and our own longings are satisfied. In so many ways, Advent is a remedy to our Black Friday woes. By observing Advent, and letting its solemn, peaceful, and prayerful rhythms animate our lives in the days leading up to Christmas, we find rest from the manic motion of the Holiday Season enterprise. We find space to long for a Savior that can truly satisfy, and hope in His coming again which is true and sure. In Advent, the Church also prepares for the coming of Christ. The actions and motivations of such preparation can also serve as an antidote to the anxiety-producing rhythms of preparing one’s home or family for holiday festivities. The spiritual preparations we make during Advent are marked by increased prayer for our world, our nations, our cities, our churches, and our families. They are marked by repentance where we call to mind the things in our hearts and lives that are not of the Lord so that we can confess them, seek Christ’s forgiveness, and join with Him as forgiven ones to continue to reveal His Kingdom here on Earth and make ready for His coming again. When we practice such postures of prayer, repentance, and expectation over the weeks leading up to Christmas, Christmas’s joy and celebration are all the more powerful. So if you are feeling restless, burnt-out, hopeless, or overcome with longing for something real, I invite you to find a church community with whom you can experience the journey of Advent. If you’re here in Cincinnati and don’t have such a community, come and join us at The Mission Cincinnati for worship every Sunday at 10 AM at the Evanston Recreation Center (3204 Woodburn Ave. Cincinnati, OH 45207)! On Thursday evenings at 7 PM during Advent (Dec. 7th, 14th & 21st), we will be gather for special Advent prayer and communion services in homes across our city. If you would like to join us for one of these special prayer services and need address information, please contact Derek at admin@missioncincinnati.org we will give you all the info you need to join us. We can’t wait to journey with you through this beautiful season. May we all experience more and more of Christ’s presence, power, and love in each day! May the Lord bless you and keep you and make His face to shine upon you and give you peace! When Michael Delfín stepped into his first worship service at The Mission Cincinnati, he said it felt like coming home. While the joyful welcome of friends and strangers was encouraging and the music and sermon were clear and uplifting, what Michael remembers most about that first Sunday was the incredible experience he had receiving communion. Our services take place in a white-washed cinder block room. When it comes time to share the Lord’s supper, the words we say around the table are ancient prayers from the Anglican Book of Common prayer that haven’t changed in centuries. Typically the celebrant (the priest presiding over the table) will offer a few words of reflection connecting the grace we experience in communion with one of the points of the sermon, but there are no pyrotechnics, no emotionally charged stuff, just an ordinary moment. And that’s what makes Michael’s experience so incredible. When he went forward to receive the elements, he recalls powerfully feeling God’s embrace: knowing Christ’s love for him, and sensing deeply in his spirit that this church was the family God was calling him to make home. When he returned to his seat, he realized he had shed tears. He had encountered God powerfully, in a way he could compare to few other moments in his life. Michael is not alone in this experience of community, welcome, and God’s presence at The Mission Cincinnati. One of our other members, AudrieAna Gardner, when asked what makes The Mission Cincinnati unique responded, “we don’t just talk about God here, we experience Him.” Others have shared similar experiences of being profoundly touched by God at the communion table. Perhaps it is the visual of children from our neighborhood sharing the body and blood of Christ with medical students, retired financiers, neighborhood leaders, and teachers. Perhaps it is the experience of people who used to not know each other from Adam, suddenly finding their lives knit together in a deeply spiritual way. Strangers now serve together and invite each other into their homes. They pray together, they worship together, and as the Apostle Peter wrote of the church in one of his Biblical letters, they are experiencing Christ building their lives together “like living stones to create a spiritual house in which God dwells” (1 Peter 2:5). Or perhaps it is simply Jesus being faithful to His promise that when two or more are gathered in His name, there He will be also (Matthew 18:20). Perhaps it is all of these things. If you live in Cincinnati and are interested in what such an experience of worship feels like, you are welcome to join us Sundays at 10 AM at the Evanston Recreation Center (3204 Woodburn Rd. Cincinnati OH 45207). If you have any questions about our church or wish to speak with a pastor, please reach out to us at william@missioncincinnati.org. One of the things we are passionate about at The Mission Cincinnati is being a church that builds bridges for the sake of Jesus between resources and needs in our community. Our neighborhood of Evanston is called "The Educating Community." Why? Because we are home to a 5-star daycare, 3 elementary schools (Evanston Academy, Alliance Academy, and the Academy of World Languages), the top-ranked public high school in Ohio (Walnut Hills High School), and Xavier University. That's a lot of schools in one neighborhood! We would not be good stewards of the Gospel in our community if we were not making every effort to reach these students with the message and love of Christ! "As a new Young Life Staff, I am continuously blown away by the relevancy of the Gospel and the kindness of God's presence admist the darkness of the lives of high school and middle school students. These past months, I have had the privilege to kick start both Young Life (ministry for high school students) and WyldLife (ministry for middle school students) at Walnut Hills and Clark Montessori. I am grateful for a team of 5 other leaders, including my wife, Emily, and a supportive parent base I have had the opportunity to coach cross country at Clark Montessori and tutor athletes at Walnut Hills High School. God has brought a group of 25 junior high students and 15 high school students at our initial events for WyldLife and Young Life. Together, that equates to over 40 lives weekly that God has put in front of us to faithfully walk alongside. As we have done so, I am reminded of my own experiences as a teenager, longing for someone to step into my life and point me towards truth. My heart broke hearing a 7th grade boy who shared: "I know who Jesus is and there are lots of people who say 'I love him' and 'he is my life,' but I just don't feel that way." What an honest picture of our youth as they seek to find life in following Jesus. Something I think we are often too afraid to say. Even hearing one 8th grade boy share after hearing a teaching about Jesus coming to Levi's party of tax collectors and sinners: "I only go to church twice a year, but I didn't know that God loved me all the time." God is at work in these schools, even one that sits at the heart of Evanston yet has been long disconnected. We were witnesses to God moving at YoungLife Fall Weekend through the message of Jesus in our students from Walnut Hills and Clark. We got to hear YoungLife staff share about the God of the Universe coming near to us alongside 600 other students from Greater Cincinnati. What a fun time for the inner city of Cincinnati. Excited to watch what lies ahead!" We are so excited about what Jake, Emily, and all the Urban Young Life leaders are up to as they share Jesus with students all across our city! Our partnership with Urban Young Life and Gospel impact in the lives of high school and middle school students is one of the many amazing ministries you can support by giving to The Mission Cincinnati this #GivingTuesday! Want to learn more about our partnership with Urban Young Life? Live in Cincinnati and want to get involved in ministry to high school or middle schoolers? We'd love to talk with you and connect you to opportunities to serve! Reach out to us by emailing william@missioncincinnati.org. Also, we'd love for you to join us in worship alongside others in this fellowship of missionaries every Sunday at 10 AM at the Evanston Rec Center (3204 Woodburn Ave. Cincinnati OH 45207). We found out about the fight on a Sunday afternoon. We were celebrating a baptism in our church when we learned that Demetrius, an elementary schooler, neighborhood resident, and one of our Mission Kids had been beaten up by older neighborhood boys the previous Friday Night in the Rec Center parking lot. His hand had been injured and he would likely have to have surgery. What made this even worse was that one of the kids who had beaten him up was also one of our Mission Kids, an older boy named Elijah who had spent many of the past few weeks learning about God across the table from Demetrius, the boy he’d now beaten up. A few weeks passed. We rejoiced when Demetrius found out he didn’t need surgery. Just a brace. Demetrius was there every Sunday but Elijah was nowhere to be found. Then came the week we’d been anticipating for awhile: Demetrius and Elijah both came to Mission Kids on the same Sunday. One of our members, Anne was leading Mission Kids that Sunday. She loves these kids. She had been praying into this situation for weeks. She knew God was up to something. Over the course of the morning she took each of the kids aside for a one-on-one conversation. When she spoke with Demetrius, she talked to him about forgiving people who hurt you, about forgiving Elijah. When she spoke to Elijah she talked about reconciliation, about the need to apologize to Demetrius. God softened hearts that morning. God brought forgiveness and healing into the lives of Demetrius and Elijah. Where there had been pain and hurt, now there was healing and restoration. Jesus makes all things new! Every week more than 15 kids from our community come to learn about the reconciling love of Jesus through our Mission Kids ministry. This is one of the many amazing ministries that you can support by giving to The Mission Cincinnati this #GivingTuesday! We'd love for every kid in our neighborhood to experience the life-transforming power of the Jesus who makes all things new. Do you live in Cincinnati? Maybe you not only want to give, but you have kids who'd like to experience this Jesus who helped Demetrius and Elijah reconcile! You're invited to join us each Sunday at 10 AM at the Evanston Recreation Center (3204 Woodburn Ave. 45207) for worship at The Mission Cincinnati! Mission Kids ministry is offered each week for children ages 0-10. We are always looking for more people who are passionate about loving our children and sharing Jesus with them. If you are interested in helping with Mission Kids or if you just have questions about our ministry or our church, reach out to us at william@missioncincinnati.org. We can’t wait to hear from you and meet you one Sunday! What's The Mission Cincinnati All About Anyway? These are just a few of the things that members of our church and residents of our neighborhood of Evanston have said about The Mission Cincinnati. Well officially, The Mission Cincinnati is an intentionally rooted, creative, diverse, and empowered community of faith seeking to love God and reveal His kingdom by stewarding His goodness, truth, and beauty in our neighborhood, our city and the world. It means we’re a church that values place. We care about playing our part in what God is up to locally in our neighborhood of Evanston and our wider parish of Uptown Cincinnati: everything from OTR and Clifton to Xavier University and Norwood. We value our place by spending time with people where they are: whether that’s hanging out at the Evanston Rec Center, sharing planned and impromptu meetings at coffee shops like Community Blend, Café DeSales, or Landlocked Social House, helping our community put on awesome events like the Evanston Trunk or Treat, a neighborhood Easter Egg Hunt, or the District 2 National Night Out, or partnering with amazing organizations like Urban Young Life, Intervarsity at UC, the Music Resource Center on Woodburn Ave. or the Evanston Area Council: we desire to be a church FOR our place. It means we’re a church that values creativity. A group of artists from our church meets every week in homes to share meals and talk about how God is revealed through writing, music, and the visual arts. We pursue excellence in our musical expression on Sundays, blending the styles of ancient hymnody with contemporary praise choruses and soulful Gospel tunes. We believe God is revealed in beauty. We want HOW we communicate Jesus to have just as much integrity as WHAT we communicate about Jesus. It means we’re a church that’s intentionally seeking to break down the walls of race, age, and socio-economics that divide our nation. We are church filled with every generation, a church of many races, and a church where wealthy and poor worship and share life together. Just as Jesus has brought reconciliation between God and man, so He empowers us to share reconciliation with one another. It means we’re a church led by the authority of God’s Word, connected to Christians across the world and throughout history through the sacraments of communion and baptism, and empowered by the life of the Holy Spirit. We are charismatic and contemplative, liturgical and spontaneous, reverent and warm, ancient and contemporary. Our worship is nourished by the streams of evangelical faith, liturgical practice, and charismatic expression. We seek to draw the best of all Christian denominational worship traditions together in one beautiful expression. It means we’re a church, coordinated by God’s mission to share the message of Jesus’ death, resurrection, and salvation with all people even while we work in the world to reveal God’s Kingdom on Earth as it is in heaven. We not only share our faith in words, but seek to establish justice on our streets. We desire to show mercy to the weak and challenge the affluent to get to their hands dirty in serving our city. We spend time getting to know each other, discerning what gifts God has given each person in our midst, and then seek to empower those gifts so that they can bless and encourage others to the greatest possible extent. The people God brings to us are a great treasure and we seek to love and shepherd everyone who comes in our doors as Christ would. 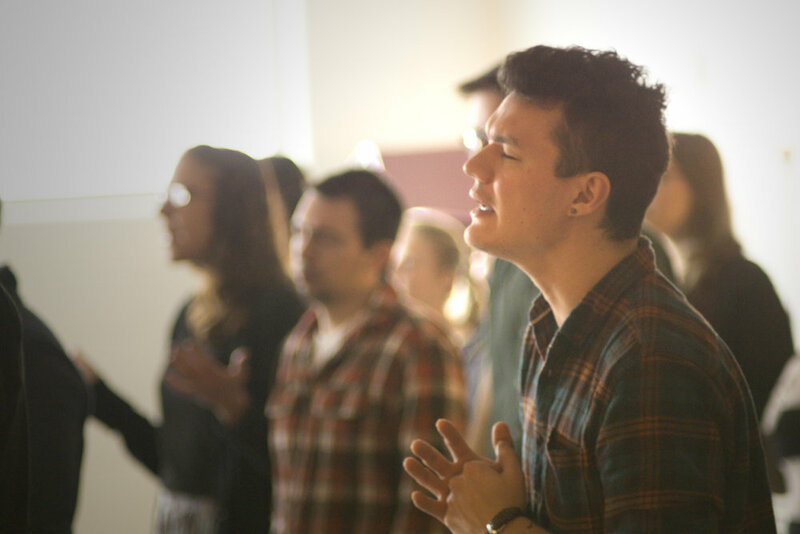 We’re a young church: we’ve only been meeting for weekly worship for 9 months. We’re a growing church: every week new people join us in worship, share meals with one another in homes, pray together, and wrestle with questions about what it means to love God and His people today, here in Cincinnati. We’re a welcoming church: all are invited to join in worship and experience the life of our community regardless of what you already do or don’t believe. We’re a fellowship of missionaries: our life together is marked by friendship and mutual welcome in community, but also in shared sacrificial service to our world. We’re not a cruise ship, we’re a sailboat: everyone matters, everyone is counted on to get involved! We’re a Christ-centered church: we believe Jesus is the only hope for our world. Want to learn more about how you can belong, grow, serve, and go as a part of The Mission Cincinnati? You are invited to come and see what God is up to here every Sunday at 10 AM at the Evanston Recreation Center (3204 Woodburn Ave.) Our services last about 1 hour and 20 minutes and involve musical worship, call and response prayer, a powerful and relevant message, and a time of communion. Mission Kids childcare is also available for children ages 0-10. Come as you are! We are a casual bunch. If you have any questions or would like more information about our church, please reach out to our pastor Fr. William by emailing him at william@missioncincinnati.org.